I know what you want. 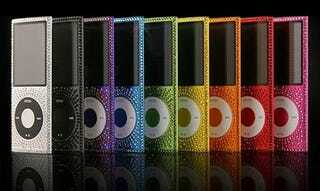 You want an iPod nano, covered in 250 color-coordinated Swarovski crystals and donning Elton John's signature. Wait, you don't? WELL IT HELPS FIGHT AIDS YOU JERKS! DON'T YOU HATE AIDS??? Offered through Goldgenie (read: not Apple), Elton's personalized iPod nanos complete with his Rocket Man: The Definitive Hits CD pre-installed can be yours for $565 (8GB) or $640 (16GB). We realize that sounds like a lot, but keep in mind that 12.5% of each purchase goes back to the the Elton John AIDS Foundation—or $45 (8GB) and $51 (16GB). Only 100 of each color will be puked on with a mixture of crystals and adhesive.